Explanation: The dust sculptures of the Eagle Nebula are evaporating. As powerful starlight whittles away these cool cosmic mountains, the statuesque pillars that remain might be imagined as mythical beasts. Featured here is one of several striking dust pillars of the Eagle Nebula that might be described as a gigantic alien fairy. This fairy, however, is ten light years tall and spews radiation much hotter than common fire. The greater Eagle Nebula, M16, is actually a giant evaporating shell of gas and dust inside of which is a growing cavity filled with a spectacular stellar nursery currently forming an open cluster of stars. This great pillar, which is about 7,000 light years away, will likely evaporate away in about 100,000 years. The featured image in scientifically re-assigned colors was released in 2005 as part of the fifteenth anniversary celebration of the launch of the Hubble Space Telescope. and when this may have happened. ? or some less extreme series of more local events more recently ?? Are there any tell-tale clues, or did the evidence evaporate with the event(s). Bit like asking how the earth came to be here, really.... ? My guess is Giant Molecular Cloud... gas and dust fall together....ignite stars... starlight pushes away dust, it thins and "evaporates"...I don't know about the time factor. It is part of a much larger complex area...in most pictures it is to the left of the "Pillars of Life"... these cavernous areas appear to create "star clusters" they are so large. Well this is my unscientific layman hypothesis. The big bang created mostly 90% hydrogen and 10% helium. Now even though those pillars probably contain a lot of that hydrogen gas, the reason they call it opaque dust is because it must be made out of stoney material too like carbon and silicon. Some iron too. That didn't exist after the big bang. It must have been made in supernova explosions from first generation stars. Now when the stars explode they blast out in every direction, so why are these things formed as pillars? Maybe dark matter comes in use. Dark matter has been said to surround ordinary matter. It also outnumbers ordinary matter by a factor of 5 or 6. Perhaps the wandering dust particles were marshaled together into the pillars by the region of dark matter. Several generations of SNs and lesser stellar outflows have built up all this opaque dust. Stellar winds from all stars in and around the area (but, especially the most massive ones) contribute to the shape of this cloud by pushing against it, illuminating it, and evaporating it. In areas where it is dense enough the dust and gas will collapse, forming new stars that will in turn wittle away at this cloud feature. I doubt that dark matter has much to do with forming clouds like this. (1) It isn't needed to explain their existence. (2) Things that are made from this star dust don't contain dark matter, i.e. people, the Earth, the Sun, etc. The pillars didn't form as pillars. They started out as slightly thick and massive parts of the very big nebula that collapsed until it created the right conditions to start making stars. The Coalsack nebula at left isn't very big or massive, and it won't ever create very massive stars. The basic principle is the same, however: You have a concentration of gas and dust, which collapses by some mechanism and creates the right conditions for making stars. Note, by the way, that the Coalsack is mostly made of gas, although it is dust that gives it its dark color. 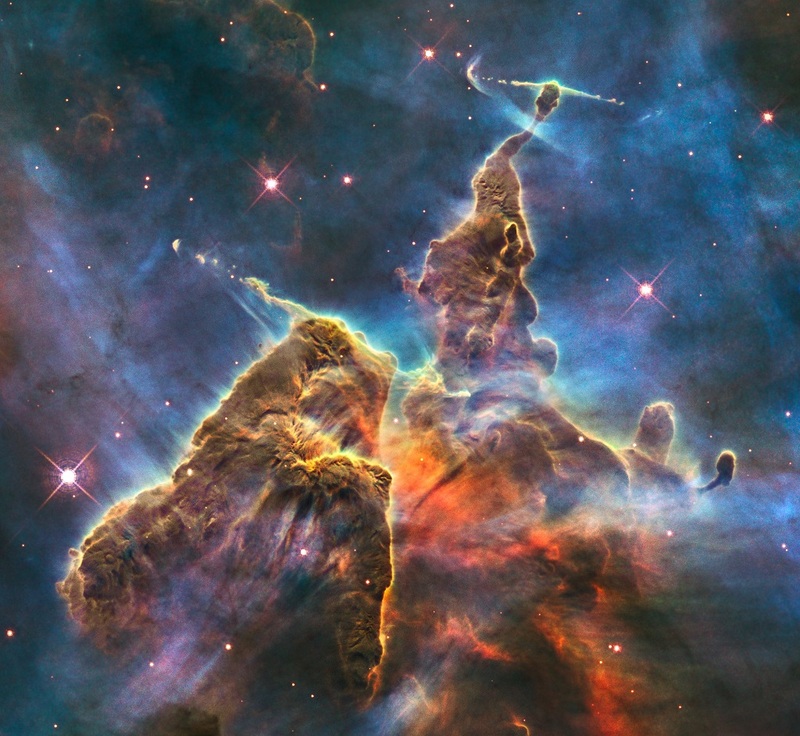 Pillars, newborn stars and jets in the Carina Nebula. We have every reason to believe that almost all newborn stars create energetic jets. But hot massive stars, the kind of stars that have been born in the Eagle Nebula, likely create even more powerful jets. Even after the massive stars have "settled down" enough not to shoot out jets, they still produce an extremely energetic stellar wind. Also they blast huge amounts of energetic ultraviolet photons at their environment. The end result? They blow away most of their natal nebula. However, parts of this nebula will always be thicker than others, and the thickest parts will last the longest. These thick structures will become "stand-alone" pillars when everything around them has been blown away. You find these pillars in most young nebulas that contain massive young stars. In the case of the "Statue of Liberty" nebula at left, the statue's head, arm, and torch are actually dust pillars. Similarly, the Horsehead Nebula is a dust pillar, the Cone Nebula is a dust pillar, the Elephant Trunk nebula is a dust pillar, and many others. 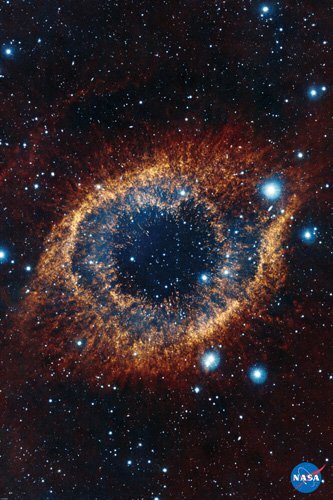 The Helix Nebula with dust pillars. Closeup of some Helix Nebula dust pillars. Dust pillars are also created in planetary nebulas, as in the Helix Nebula, and basically by the same mechanism. Even though the central star of a planetary nebula isn't very massive at all, it is still very hot, and it blasts its own cast-off outer layers with a fierce wind and hard ultraviolet light. Nebulas like this are mainly made of hydrogen. All that dust (the silicates and other compounds made from heavy elements) constitute just a few percent of the total mass. As you note, the heavy atoms were produced by stars, most of it distributed by supernovas. Those same supernovas created shock fronts that produced density gradients which were the seeds of regions of gravitational attraction, causing the collapse of hydrogen clouds and the dust within them. Once the density became high enough, stars formed, and the combination of additional supernovas and hot stellar winds began disrupting the nebula, leaving behind the pillars. That is, the pillars probably did not form as such, but are surviving remnants. It's unlikely that dark matter played any role in this, as we don't find evidence of dark matter halos associated with hydrogen clouds. Can I suggest, after a week of binge Harry Potter viewing, that we rename this image Aragog meets a death eater?